Just as promised, the Meizu m2 note was announced today and all eyes are on the impressive mid-range device, with a tantalizing price tag of only $160. But this might not be the only surprise Meizu has in store. The eagerly-anticipated successor to the legendary MX4 has been a constant presence is the rumor mill for quite some time now and even though it skipped today's announcement event, a new set of leaked renders hint that it might be inching towards a release. A date has even been tossed around - June 30, which is just around the corner. The new images are pretty similar to what we have already seen and yet, there are some notable differences between the leaks. From the looks of things, Meizu has went for a unibody metal design, with a flat back, curving over the edges. Just like with the m2 note, the signature round button, has been swapped with a physical one. Its shape is reminiscent of what we see in Samsung Galaxy devices and does allow for a fingerprint reader. The m2 note doesn't have one, but perhaps, the flagship MX5 will. One instantly-noticeable discrepancy between the two set of photos is that the 3.5mm jack has been moved from the top of the device to its bottom. Meizu doesn’t really have a reputation of messing with its controls too much, but, seeing how the button has changed, anything is possible. The Meizu MX5 is rumored to pack a 5.5" QHD display and run on a MediaTek top of the line chipset. Rumors say that it will be among the first devices to run on the new MT6769 Helio X20 powerhouse with a 10-core processor. 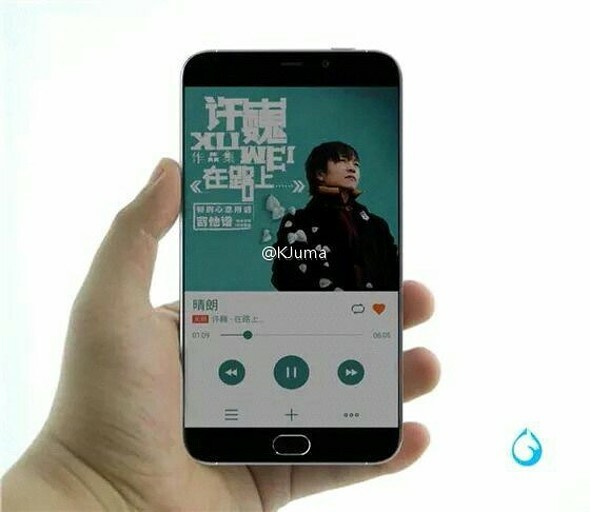 Operating memory on the new Meizu will likely be 4GB, as the chipset can handle it and market trends are going that way. Another rumor suggests that Meizu will equip the phone with an instead 41MP camera.